Fernando Alonso Díaz is a Spanish Formula One racing driver and a two-time World Champion who is currently racing for the Mclaren F1 team. Former Minardi F1 driver Adrián Campos gave Alonso his first test in a race car in October 1998. The two-time world champion who halted the streak of the great Schumacher seemed certain to be the next dominant star for the sport with two consecutive crowns back in 2005-06 and with Schumacher retiring. To the irony, no titles have followed him in the following years except for the runner-up silverwares. Started off his career ion the kart field along with his dad, who doubled with him as his mechanic. Though his family financially lacked the resources his performances attracted sponsorships and funds which has made him the star he is now. Alonso won four Spanish championships back-to-back in the junior category, between 1993 and 1996 and the Junior World Cup in 1996. He won the Spanish and Italian Inter-A titles in 1997 and in 1998 won the Spanish Inter-A title again as well as finishing second in the European Championship. Former Minardi F1 driver Adrián Campos gave Alonso his first test in a race car in October 1998, before signing him in the 1999 Spanish Euro Open MoviStar by Nissan Series. A problematic move to F3000 in 2000 was but a brief hiccup, and a Formula 1 test with Minardi that same year secured him his first F1 race drive with the team. That test seat became a race drive for 2003. 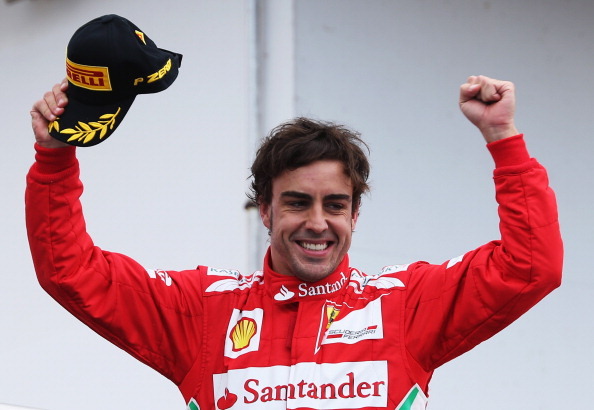 At the age of 22, Alonso made F1 history by becoming the youngest-ever pole sitter in Malaysia and then the youngest Grand Prix winner with a maiden victory in Hungary. That, however, was just the beginning. Remained with the Renault for the following year as well, finished the season at 4th place in the championship standings. The following year Alonso pushed the French team’s ever-improving machine to its limits, by claiming the drivers’ crown with two races left to run. The star’s rise was visible when he defended his lead from Michael Schumacher for the last thirteen laps, to take victory in the 2005 San Marino Grand Prix. In 2006, Alonso thus became the youngest double champion in the sport's history which helped Renault to clinch the Constructors' Championship with a 5-point gap over Ferrari. For 2007 he moved to McLaren, giving him the chance to become the first man since Juan Manuel Fangio to score successive championships with different teams. With intense rivalry developing between Hamilton and Alonso, it was not a surprise when news came out that Alonso would leave McLaren and return to Renault for the 2008 season. Back then Renault’s machine wasn’t a championship contender but still, the Spanish driver was pushing the lackluster performer into a race winning machine for two years, which earned him a signing from Ferrari to drive along Felipe Massa. It was a change of fortunes for Alonso since he took the seat of the red machinery, finishing at 2nd place in 2010, 4th in 2011, 2nd in 2012 and 2013, despite his team’s strategies and machine, which was rarely unable to match its rivalries, Red Bull and McLaren. Once more, Alonso' choice of timing for a team move was not fortuitous, moved to McLaren when the rejuvenated Ferrari took the fight to Mercedes, while McLaren dropped to the back of the grid as their revived partnership with Honda was getting off to a highly difficult start. But the revived McLaren-Honda partnership took another, ultimately terminal, a nosedive in 2017 when an increasingly frustrated Alonso could wrestle no more than 17 points from his underpowered machine. The team's move to Renault power for 2018 put an end to the speculation over his McLaren future as the move promised a package to match Alonso's ambitions of a third world title. F1 News: Is Fernando Alonso going to test the new McLaren MCL34 at Barcelona?